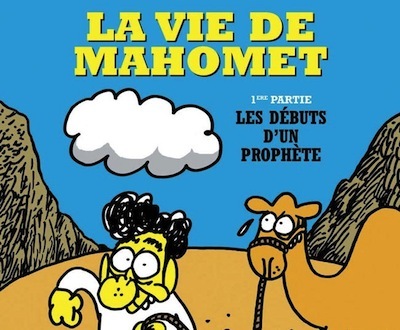 Tomorrow, Charlie Hebdo will publish La Vie De Mahomet: Les Debuts d'Un Prophet, a comic-book biography of Mohammed by Stephane Charbonnier and Zineb el Rhazoui. This will be the fifth time that the newspaper has printed provocative images of Mohammed: its first Mohammed cartoon was published in 2002, followed by a 2006 Mohammed cover, a Charia Hebdo edition 'guest-edited' by Mohammed in 2011, and a naked Mohammed caricature last September (criticising the protests against Innocence Of Muslims). Mohammed cartoons first caused controversy when a dozen of them were published by Jyllands-Posten in 2005. Since then, many other newspapers and magazines have also printed Mohammed caricatures: Weekendavisen, France Soir, The Guardian, Philadelphia Daily News, Le Monde, Liberation, Het Nieuwsblad, The Daily Tar Heel, Akron Beacon Journal, The Strand, Nana, Gorodskiye Vesti, Misselijke Grappen, HP/De Tijd, Dagbladet, Adresseavisen, Uke-Adressa, and Harper's. The International Herald Tribune published Mohammed cartoons in both 2006 and 2012.